In the five years since the 2013 Boston Marathon bombing took place, Bostonians have remained true to the phrase “Boston Strong” – the two-word phrase that united the city and circled the globe in the aftermath of the senseless tragedy. On that infamous day, thousands of spectators and residents can recall reaching for their mobile devices to frantically locate family and friends. Unfortunately, the high call volume saturated the local cellular networks causing signal delays and failed calls rendering mobile phones nearly useless. For area first responders on duty that day the consequences of poor network coverage and capacity was more dire -- the lack of a reliable network delayed the ability to share the images and videos that ultimately helped to identify the alleged perpetrators. Looking back on 2013, we learned that video and data changed the communications landscape for emergency response. As security preparations were underway for the 2018 Boston Marathon, FirstNet, the first nationwide wireless broadband network dedicated to public safety, was in place to bolster emergency communications for first responders. 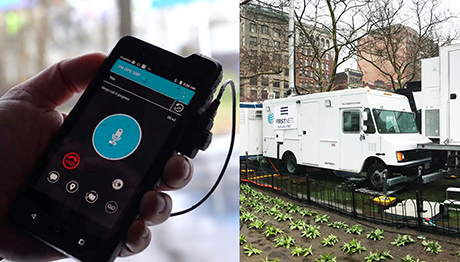 During this year’s marathon, the First Responder Network Authority (First Responder Authority) team and AT&T were on hand to distribute 80 FirstNet devices to fire, police and incident response teams from the cities of Boston and Brookline. Thirty of these phones were outfitted with SIM cards and connected to the dedicated FirstNet Core. First responders participating in the demonstration used FirstNet-ready devices with push-to-talk and land mobile radio integration applications. These first responders also had an opportunity to test out FirstNet’s Core that operates with physically separate hardware and is built as a highly secure, resilient and redundant network. The Core is what distinguishes FirstNet from other commercially available networks that can become overloaded and useless during large-scale events. Scott Wilder, Director of Technology and Communications for the Brookline Police Department, noticed the difference when communicating over FirstNet’s reliable and hardened network compared to the network that failed to sustain his wireless connection while on duty during the 2013 Boston Marathon. In addition, fire and police used location tracking applications with new capabilities for coordination response efforts to track personnel and resources. For the first time, the Boston Fire Department were able to see the exact position of individual responders displayed on screens in their communications center and mobile command units. Commanders knew which responder was closest to an incident and made real-time decisions to dispatch the closest responder saving valuable time. Similarly, the Boston Police Department used the tracking software to pinpoint the lead runners in all major race categories. From a public safety perspective, tracing the fastest runners proved valuable for making decisions about crowd control and street closings. The First Responder Authority was honored to have the opportunity to work with the City of Boston and Brookline’s first responders. As more communities subscribe to FirstNet services, first responders across the country will soon share Boston’s experience of communicating over a superior network. After the 2013 bombings, Scott Wilder learned that emergency responder s in all communities deserve the ability to communicate seamlessly. “The FirstNet network is long overdue for public safety,” said Wilder. To learn more about how public safety agencies utilized FirstNet at the marathon, please view the following video.